The Cadillac Eldorado is a luxury car that features two doors and was marketed towards personal users, rather than for business or family. The first Eldorado was released in 1953, and production continued until 2002. The early models produced were either at, or close to, the highest price range of their entire line of Cadillac cars. In fact, the convertible that was released in 1953 was the most expensive vehicle available from Cadillac. It became somewhat of a sought-after icon due to the price and the luxurious status that accompanied owning one of Cadillac's finest. During later years, the Eldorado became more affordable and alternatives were produced in the luxury car market by Cadillac and their competitors. Eldorados were given the designation of Fleetwood from 1965 until 1972. The Eldorado Biarritz was released in 1961, and was designed to be even more luxurious than previous models. In 2000, the EldoRODo concept car, which was based on the Eldorado, was received by the public with mixed interest. 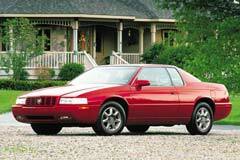 However, Cadillac made the decision to discontinue the car, and 2002 was the year of the final Cadillac Eldorado. 1991 Cadillac Eldorado GT, Rare Classic Beauty 1991 Cadillac Eldorado GT! Rare Find! Timeless Body! 1 Owner!